Thurrock Car and Van Rental - Essex based car rental company that offers a comprehensive vehicle rental service. Thurrock Car and Van Rentals are a Essex based company that offers a comprehensive Private and Commercial vehicle rental service. We deliver and collect within Thurrock and the surrounding area and all our rental vehicles come comprehensively covered to ensure you have peace of mind. Copyright 2017. 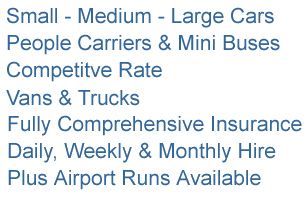 Thurrock Car and Van Rental. All Rights Reserved.